avid Bernard Loveman Noa (1876-1901), known as Loveman, was born in Knoxville, Tennessee in 1876, the last of the four children of Rose B. Loveman (1842-1923) and Ismar Noa (1836-1906). Rose was the daughter of Bernhard Loveman (1808-1867) and Bettie Newman (1818-1891) and Ismar was one of the partners of Rose's brother David Bernard Loveman (1844-1926), founder of D. B. Loveman and Company in Chattanooga. He grew up in Chattanooga and went on to the U.S. Naval Academy, from which he graduated in 1900. 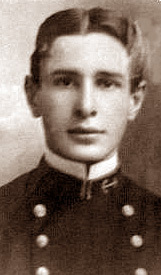 Noa was a war hero who died in the Philippines during the Spanish-American War. He and a crew of six boarded a small boat in 1901 to search for smugglers near the islands of Lem and Samar. They landed the boat and went scouting in nearby woods, where he he was stabbed to death by Filipino insurgents. The U.S.S. Noa, a Clemson-class destroyer in the U.S. Navy, was named in his honor. It was launched in 1919 and commissioned in 1921. Loveman Noa Memorial Tablet at the U.S. Naval Academy in Annapolis. Photos courtesy of Philip Morehead. Click to enlarge. r. Celia Rich (1878-1953) was the fifth of eleven children of William Rich (1842-1917) and Rosa Loveman (1850-1908), daughter of Morris and Eva Esther Loveman. Her father, Hungarian-born, had emigrated in approximately 1855, and arrived in Nashville around 1880. He joined his wife's brother Adolph Loveman in the lumber business and also succeeded in real estate. Born in Atlanta, she accompanied her family to Nashville at age two and grew up there. She won a medal for the highest average for the three years she spent at Fogg High School. She then went on to Vanderbilt University Dental School, where she received the Founder's Medal and several departmental awards upon her graduation in 1898. After postgraudate education at the University of Michigan, she returned to Nashville and went into practice with her brother, Stanley Loveman Rich (1880-1953). She continued in this dental practice until retiring in 1952. Nashville's First Ladies' Dissecting Class, January 2, 1896. Celia Rich is in the center. Photo courtesy of the Archives of the Jewish Federation of Nashville. Click to enlarge. Celia's long career was characterized by many honors and achievements in the field of dentistry. She was president of the Nashville Dental Society in 1914 and the first president of the National Association of Women Dentists in 1922-23. For many years she was associate editor of the Journal of Periodontology. She was also a patron of the arts in Nashville.